This week's CAS challenge was to create a monochromatic card (white or cream was allowed as a neutral). I've been dying to play with my new SU dp, so I figured this challenge was the perfect way to show it off. I love that DP! SO cute! Great card! I love the red & white combo!! TFS! Love the bold pattern and great colours. Very pretty! I forgot how much I love monochromatic cards! Love this---I actually had to go & look up this paper---I thought it was Pink Flamingo, but wasn't sure! Stunning! What cool patterned paper. I like how you offset the bold pattern and colors with the plain white panel for balance. this is gorgeous girl, love the bright red flowers on white, gives an elegant look. I love this Ann!! Great card! What a stunningly beautiful card! Gorgeous card! Love the rich colors, that design paper is gorgeous! Beautiful job on this!!!! Love the bright red!!! Have a wonderful day hun!!! 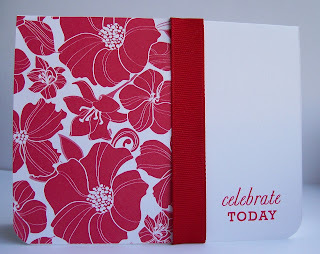 What a beautiful card - very striking color, and the sentiment is so versatile! Ann, this is just GORGEOUS!! I love this card Ann! I'm going to try and follow these challenges on my blog....wish me luck!! I love your card! The DP is so pretty and vibrant too! What?!? How'd I miss this beauty?!? LOVE, love, love it!! And that DP is to-die-for! Oh so stunning! Love the simple colros and the pp! Oooh, muy fabulous! Love the dramatic colors! Absolutely STUNNING!!! And I love this layout, need to case it for my next class, it'll be perfect.